TM 1-1520-240-10 2-4-4 pounds per hour in 100 pound increments. The signal to drive the indicator is derived from a fuel Figure 2-4-5. 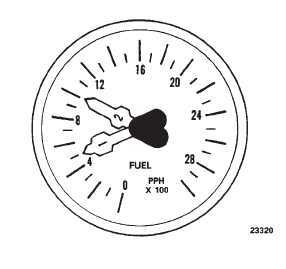 Fuel Flow Indicator. flow transmitter in the fuel line of each engine at the quick disconnect shelf. Power to operate the No. 1 indicator is from the No. 1 AC bus through the ENGINE NO. 1 FUEL FLOW circuit breaker on the No. 1 DP. Power to operate the No. 2 indicator is from the No. 2 AC bus through ENGINE NO. 2 FUEL FLOW circuit breaker on the No. 2 PDP. 2-4-10. Pressure Refueling System. The pressure refueling system permits rapid refueling of all fuel tanks simultaneously or selective refueling of any tank or combination of tanks. Maximum fueling rate is 300 gallons per minute at 55 psi. The system control panel and refueling nozzle receptacle are on the right side of the helicopter above the forward right landing gear (fig. 2-4-6). In addition to the control panel and refueling receptacle, the system consists of dual fuel level control valve, a dual fuel shutoff valve in each tank, a jet pump in each main tank, and pressure refueling manifold. a. Dual Fuel Level Control Valves and Dual Fuel Shutoff Valves. The dual fuel level control valves control the operation of the fuel fuel shutoff valves. When fuel in a tank rises to the full level during pressure refueling, the floats in the control valve close and apply a signal to the shutoff valve, closing it. the floats can also be closed electrically to stop fuel flow into a tank at some intermedi- ate level. The floats are controlled by the FUEL CELL SHUTOFF VALVE TEST switches on the refueling con- trol panel. b. Jet Pumps. The jet pump installed in each main tank evacuates the refueling manifold and discharges the displaced fuel into the main tank. The jet pump is activated when the forward boost pump in each main rank is first turned ON following pressure refueling. c. Pressure Refueling Manifold. The pressure re- fueling manifold connects to all tanks to the pressure refueling receptacle. It does not include projectile resist- ant features because the fuel is evacuated before flight by the jet pumps. Electrical power is applied to the system only when the REFUEL STA switch on the cockpit FUEL CONTR panel is placed to ON. Power to operate the pressure refueling system is supplied by the DC switched battery bus through the REFUEL circuit breaker on the No. 1 PDP. 2-4-11. Controls and Indicators. Except for the REFUEL STA switch on the cockpit FUEL CONTR panel, all pressure refueling system controls and indicators are on the pressure refueling station panel (fig. 2-4-6). 2-4-12. PWR Control Switch. The PWR (power) control switch is labeled ON and OFF. When placed to ON, electrical power is applied to the pressure refueling system and to the refueling station quantity indicator provided the REFUEL STA switch on the cockpit FUEL CONTR panel is at ON. Also, the PWR ON light will illuminate, the fuel quantity indicator will register the quantity of fuel in the tanks, and the REFUEL VALVE POSN lights will illuminate momentarily. When placed to OFF, electrical power is removed. 2-4-13. REFUEL STA Switch. The REFUEL STA switch is on the cockpit FUEL CONTR panel (fig. 2-4-1) when placed to ON, applies electrical power from the DC switched battery bus to the PWR ON switch on the refueling station panel. Setting the switch to OFF after pressure refueling, closes the refuel valves and discontinues electrical power to the refueling panel. When pressure refueling, be sure the switch is at ON at all times. If the switch is at OFF, the aft auxiliary tanks will not fill, the remaining four tanks will fill to maximum, the refuel station quantity indicator is inoperative, and there is no precheck capability. 2-4-14. Fuel Quantity Indicator and Selector Switch. The pressure refueling station fuel quantity indicator and selector switch (fig. 2-4-4) are identical to those in the cockpit. The indicator at the refueling station indicates fuel quantity only when the REFUEL STA switch on the cockpit FUEL CONTR panel (fig. 2-4-1) is at ON and the PWR switch on the refueling station panel (fig. 2-4-6) is at PWR ON. Electrical power to drive the indicator is AC from a solid-state inverter in the cabin at sta 220. The inverter, in turn, is powered by the DC switched battery bus through the FUEL REFUEL circuit breaker on the No. 1 PDP. 2-4-15. FUEL CELL SHUTOFF VALVE TEST Switches. Seven three-position FUEL CELL SHUTOFF VALVE TEST switches are on the refueling control panel (fig.